One thing I really liked about the program was that you can customize just about everything! this feature makes it very useful no matter what field you are in. I am a real estate agent, and I found it easy to customize according to my needs. The customer service offered is very responsive and polite. I received follow up phone calls and the agents I spoke with were very helpful and knowledgeable. I see Prosper Works as an affordable option. I had been a Top Producer user for many years but their interface is now old and not user friendly. I bought and tried Contactually for 4 months but found that it had shortcomings for real estate purposes. I trialed Prosperworks and then bought. It is super intuitive to use. Has a great “pipeline” view so that I can see how my brokerage is running. The Chrome extension allows for easy client detail capture from Gmail and the ability to have all correspondence visible within Prosperworks is great. Email tracking is very valuable. Pipeline opportunity view. Chrome Gmail extension. Ability to add multiple property transactions to each client, add unlimited clients to a transaction.Call log. Future action scheduling. Integration with Mailchimp. 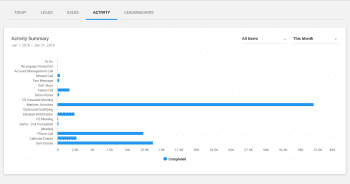 Email tracking within Gmail. Onboarding and support is great. Tutorials are available online and they have weekly webinars that you can drop in on to help you. If you are looking for a user friendly CRM system for real estate, this is head and shoulders above the others I have tried. Contactually, Salesforce, Insightly and Top Producer. I had been a Top Producer user for many years but their interface is now old and not user friendly. I bought and tried Contactually for 4 months but found that it had shortcomings for real estate purposes. I trialed Prosperworks and then bought. It is super intuitive to use. Has a great “pipeline” view so that I can see how my brokerage is running. The Chrome extension allows for easy client detail capture from Gmail and the ability to have all correspondence visible within Prosperworks is great. Email tracking is very valuable. Pipeline opportunity view. Chrome Gmail extension. Ability to add multiple property transactions to each client, add unlimited clients to a transaction.Call log. Future action scheduling. Integration with Mailchimp. Email tracking within Gmail. Onboarding and support is great. Tutorials are available online and they have weekly webinars that you can drop in on to help you. If you are looking for a user friendly CRM system for real estate, this is head and shoulders above the others I have tried. Contactually, Salesforce, Insightly and Top Producer. We’ve been using ProsperWorks for about a year now. Many of the problems we’ve had with it have been human issues (forgetting to move an opportunity from one level of the pipeline to the other). Some of the issues that were software related were easily handled by customer service (and honestly – mostly end-user issue, not software) Streamlined, and integrated right into our email, which is hosted by gmail. Great customer support frequent updates from ProsperWorks when things are being changed/added/maintained. Not many, really. Some issues with client information being posted to the dashboard if not properly entered. Opportunities don’t seem to show up on the dashboard. Definitely try this out. Yes, there are free CRMs, and some of them are also pretty good. But make sure you do your due diligence and definitely check out ProsperWorks. If your email is hosted by any of their supported email clients, you will be amazed at how easy it is to ensure proper tracking. We’ve been using ProsperWorks for about a year now. Many of the problems we’ve had with it have been human issues (forgetting to move an opportunity from one level of the pipeline to the other). Streamlined, and integrated right into our email, which is hosted by gmail. Great customer support frequent updates from ProsperWorks when things are being changed/added/maintained. Not many, really. Some issues with client information being posted to the dashboard if not properly entered. Opportunities don’t seem to show up on the dashboard. Definitely try this out. Yes, there are free CRMs, and some of them are also pretty good. But make sure you do your due diligence and definitely check out ProsperWorks. If your email is hosted by any of their supported email clients, you will be amazed at how easy it is to ensure proper tracking. This product has changed the way we do business and recruitment for leads! Having a great CRM that can sync seamlessly into Gmail has saved us so many minutes turned into hours of converting contacts into our system to reach out to them. They have provided great, consistent support and at an excellent price-point It easy integration with our Gmail accounts and how cleanly we can sort contacts at various stages of follow up. As with several other CRM’s we’d seen, there is a certain amount of redundancy within the system, leaving you multiple ways to almost do the same thing thus those functions can become unused if you are lacking more formal training. This product has changed the way we do business and recruitment for leads! Having a great CRM that can sync seamlessly into Gmail has saved us so many minutes turned into hours of converting contacts into our system to reach out to them. It easy integration with our Gmail accounts and how cleanly we can sort contacts at various stages of follow up. As with several other CRM’s we’d seen, there is a certain amount of redundancy within the system, leaving you multiple ways to almost do the same thing thus those functions can become unused if you are lacking more formal training. The software is easy to use and can be customized to your needs. I think if you’re looking for a CRM and you’ve never used one before, this is a good way to get introduced to CRM so you can establish what you like and don’t like. I’ve used other CRM softwares before and there’s always something I like and don’t like. But overall this one fit the job and was interchangeable where I needed it to be. If you’re starting out your business and you’re not sure what to look for the PropserWorks team will really educate you on how it works. It does sync with gmail which is great for us, there were a few kinks I couldn’t figure out but again, overall this is a great program. syncs to gmail and has extensions to use within gmail, easy to use, straightforward, customizeable I couldn’t get my gmail calendar to sync with it. Too much customization, it was hard to teach my boss how to use it just because I could change so many features to fit his style of working. This is a great starter program that does more than the basic cheap ones, but really gives you a chance to test out what you like and don’t like in a CRM. The software is easy to use and can be customized to your needs. I think if you’re looking for a CRM and you’ve never used one before, this is a good way to get introduced to CRM so you can establish what you like and don’t like. I’ve used other CRM softwares before and there’s always something I like and don’t like. But overall this one fit the job and was interchangeable where I needed it to be. If you’re starting out your business and you’re not sure what to look for the PropserWorks team will really educate you on how it works. It does sync with gmail which is great for us, there were a few kinks I couldn’t figure out but again, overall this is a great program. I couldn’t get my gmail calendar to sync with it. Too much customization, it was hard to teach my boss how to use it just because I could change so many features to fit his style of working. This is a great starter program that does more than the basic cheap ones, but really gives you a chance to test out what you like and don’t like in a CRM. ProsperWorks was founded in 2011 by Jon Lee and Kelly Cheng with the aim of empowering small business to improve their sales flow with an easy-to-use, powerful and attractive CRM. ProsperWorks benefitted from its founders’ years of experience in the tech industry, including as entrepreneurs, and was joined by leaders in engineering and product design from Facebook Mobile, BaseCRM and Salesforce. ProsperWorks is built exclusively for G-Suite — formerly known as Google Apps — and it was named by Google its “Best New Tech Partner” at Google TeamWork 2016. ProsperWorks is the only CRM recommended by Google in Google Apps; in fact, ProsperWorks includes Google as a customer. In 2016, ProsperWorks raised $24 million in Series B funding. It’s headquartered in San Francisco, California. 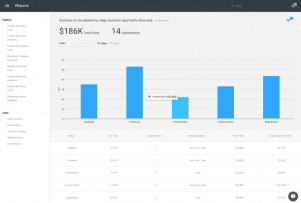 ProsperWorks offers three subscription tiers for its CRM — Basic, Professional and Business. It also offers a fourth tier, Enterprise, which provides a custom integration of ProsperWorks. Companies interested in the Enterprise subscription are encouraged to contact ProsperWorks directly at sales@prosperworks.com. ProsperWorks is, and always has been, a CRM specifically for G-Suite. It’s gone through many incarnations over the years; since its founding in 2011, it’s grown from a widget that existed solely within your Gmail to a full-fledged CRM with contact, lead and opportunity management, multiple pipelines, custom field, dashboards, automations and reports. And, of course, it’s still got its Gmail widget. ProsperWorks continues to update its platform; in 2017, they added new features to the CRM including the ability to send and reply to emails (previously users had to return to Gmail), added Slack integration and upgraded its opportunity management features, such as custom Opportunity field layouts specific to particular pipelines. Users could already create custom fields and customize field arrangements for Contacts, Leads, Opportunities, Tasks and Projects. The added feature accounts for opportunities progressing through different sales processes within the same company. ProsperWorks doesn’t offer a huge range of features but it performs within its range quite well. 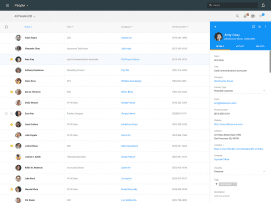 If your business relies heavily on G-Suite — especially Gmail, Google Sheets, Docs and Calendar — then ProsperWorks offers an accessible CRM, with a familiar user interface, and powerful features for its weight class. Its most prestigious selling point the fact that Google is a customer; even for a CRM that caters exclusively to G-Suite, this is an impressive name on their resume. It’s a well-designed platform that’s deceptively easy to use and has ambitious plans for further development. Besides their 2017 update, their CEO has indicated plans for machine-learning features, and future integrations with QuickBooks Online, Xero, Zendesk and Vonage are in the works. If your company is invested in G-Suite, or is willing to, and you’re also in the market for a seamless CRM, ProsperWorks’ 14-day free trial is definitely worth a try. What Do You Think of ProsperWorks?